My teacher, Udaka Michishige was chosen by the Nihon Nōgakukai to perform the Noh Giō (祇王）at their annual “Noh appreciation event” on March 31st 2013. 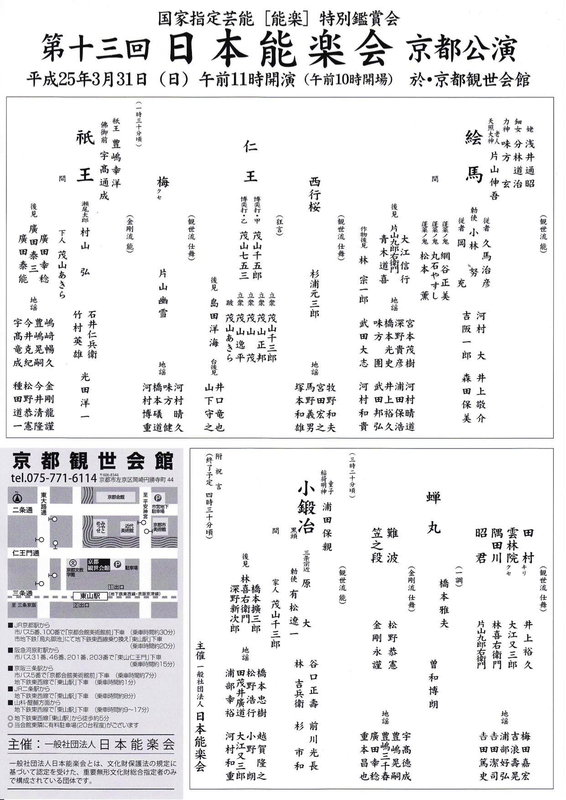 This year 3 performances will be held at the Kanzekaikan theatre in Kyoto: Ema, Giō, and Kokaji. 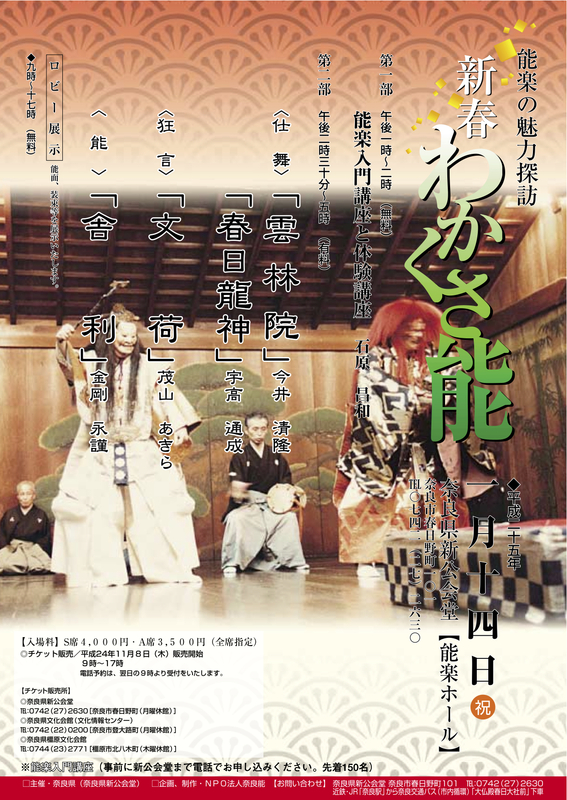 Giō is a play by Zeami, currently in the repertoire of the Hōshō, Kongō, and Kita (under the title Futari Giō) schools, though it is not often performed. Giō Gozen, one of the favourite dancers at the service of Taira no Kiyomori has helped dancer Hotoke Gozen to gain the lord’s favour. After having seen Hotoke’s dance, Kiyomori likes her more, but she promises Giō not to take her place. Similarly to the play Futari Shizuka, Giō has shite and tsure dancing in synchronous on stage. My teacher wrote this for me the other day. It means something like ‘doesn’t know, doesn’t come’. Could it be the slogan for a new advertising campaign? Last Sunday I attended the Noh Hōjōgawa, which my teacher, Udaka Michishige, performed as part of the Teiki Noh (regular subscription series) at the Kongō theatre in Kyoto. Hōjōgawa is a rather unusal play – I learnt from Ogamo Rebecca Teele that it was the first time to be performed in sixty years, which probably means that the last person to perform it in our school was the late iemoto Kongō Iwao II. 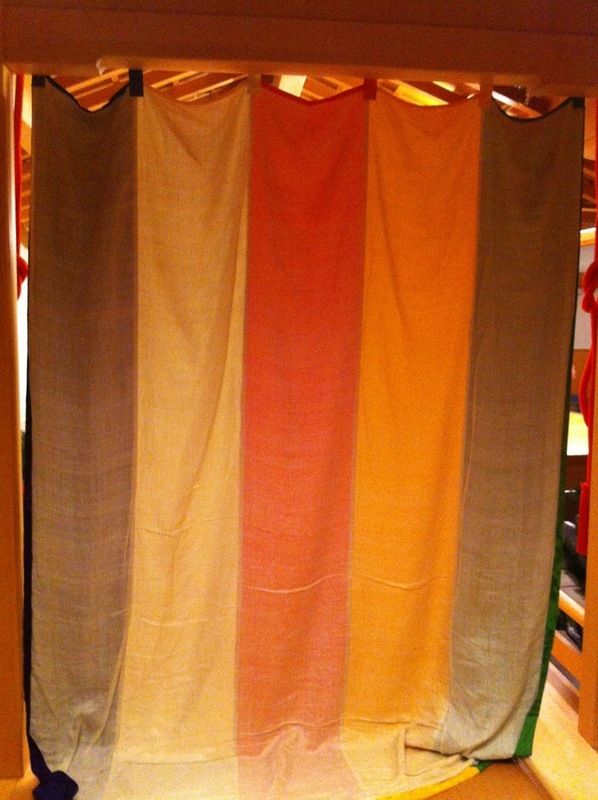 Hōjōgawa is a first category Noh (Kami-nō), and is attributed to Zeami. To my knowledge no full translation of he play has been published to date – the only available translation is by Ross Bender, who translated the first half, and has also written on the origin of the Hōjō ritual and its relation with the cult of the god Hachiman in places like Usa and Iwashimizu. In the play a shinto priest visits the Iwashimizu Hachiman shrine in Autumn, during the Hōjō-e ritual, when fish are returned to the river symbolising repentance for the killing of animals, prohibited by the Buddhist law. There he meets an old man carrying a pail with fish in it, who explains to the priest about the ritual. In the second half the god Takeuji appears and dances in celebration of the wealth of the country and of its emperor. I thoroughly enjoyed the play which features the typical Kami-nō powerful entrance for the waki, and a stately Shin-no-jo-no-mai slow tempo dance. First category plays are not particularly interesting because of their dramaturgy – the real midokoro are the atmosphere of solemnity and sacredness brought by the presence of a god, and emphasised by special music, such as the long shin-no-issei for the entrance of Shite and Tsure in the first half, or the Raijo exit music, where Shite and Tsure, still in the form of commoners, exit the stage at the accompainment of the taiko stick drum, usually associated with supernatural beings, thus revealing their true identity. Do you know about Minamoto-no-Toru and his world? 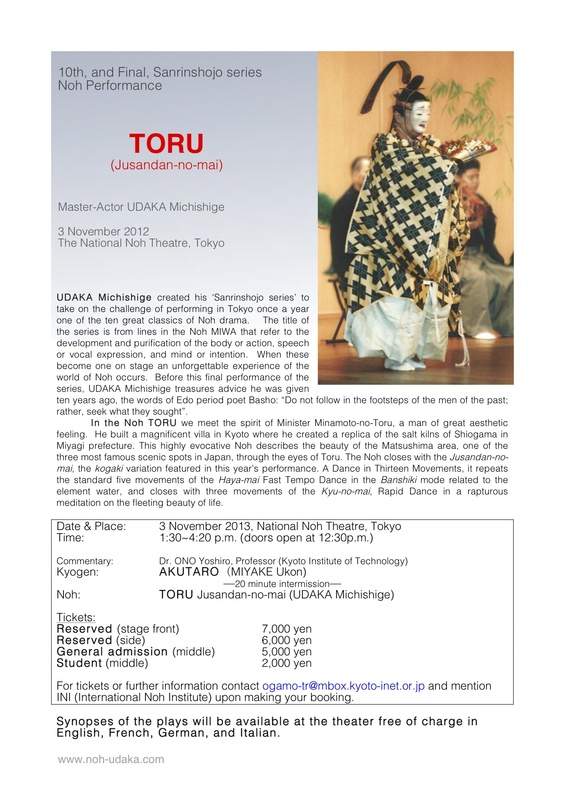 Answer the following question for a free ticket to the Sanrinshojo Noh performance of TORU on November 3rd. In TORU a Priest meets an Old Man who is going to collect salt water to make salt. In what Noh play do two sisters appear who are also collecting salt water? A free ticket is available for the first three correct answers to the question. When applying be sure to state your name, age, nationality/country, the name of institution where you are studying in Japan and address where we should send your ticket. Deadline for answers is October 19th. Synopses of the plays will be available at the theatre free of charge in English, French, German, and Italian. 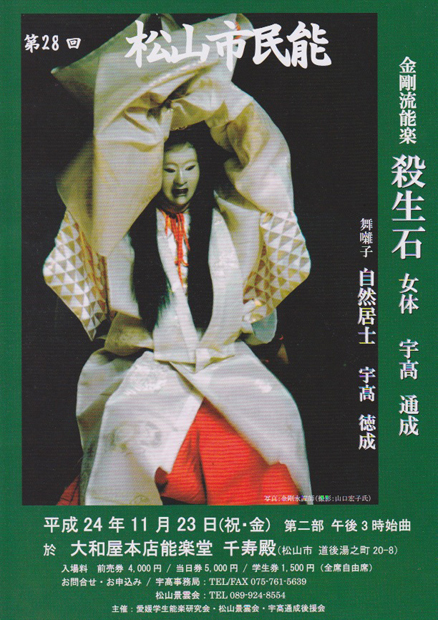 UDAKA Michishige created his ‘Sanrinshojo series’ to take on the challenge of performing in Tokyo once a year one of the ten great classics of Noh drama. The title of the series is from lines in the Noh MIWA that refer to the development and purification of the body or action, speech or vocal expression, and mind or intention. 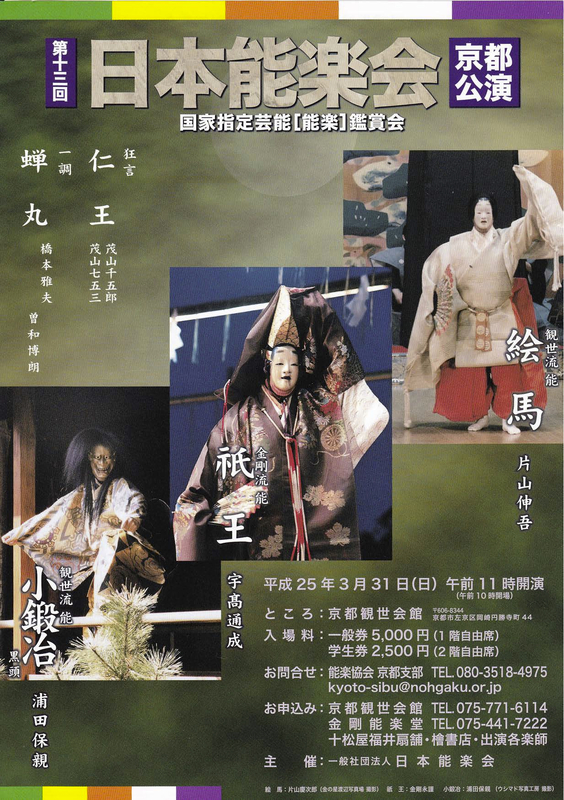 When these become one on stage an unforgettable experience of the world of Noh occurs. Before this final performance of the series, UDAKA Michishige treasures advice he was given ten years ago, the words of Edo period poet Basho: “Do not follow in the footsteps of the men of the past; rather, seek what they sought”. In the Noh Toru we meet the spirit of Minister Minamoto-no-Toru. He built a magnificent villa in Kyoto where he created a replica of the salt kilns of Shiogama in Miyagi prefecture. This highly evocative Noh describes the beauty of the Matsushima area, one of the three most famous scenic spots in Japan, through the eyes of Toru. 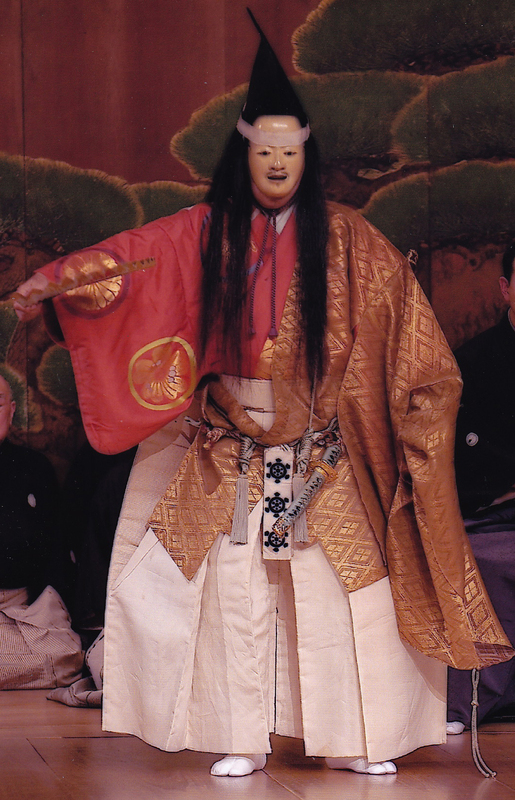 The Noh closes with the Jusandan-no- mai, the kogaki variation featured in this year’s performance. A Dance in Thirteen Movements, it repeats the standard five movements of the Haya-mai Fast Tempo Dance in the Banshiki mode related to the element water, and closes with three movements of the Kyu-no-mai, Rapid Dance in a rapturous meditation on the fleeting beauty of life. Reserved (stage front) 7,000 yen, Reserved (side) 6,000 yen, General admission (middle) 5,000 yen, Student (middle) 2,000 yen. For tickets or further information contact: ogamo-tr@mbox.kyoto-inet.or.jp and mention INI (International Noh Institute) when you book your ticket!